The Royal Monastery of Santa Maria de Guadalupe was the most important monastery in Spain for more than four centuries. It has especially high symbolic value, linked to both the Conquest of Granada and the discovery of the New World in 1492 (the New World, where Our Lady of Guadalupe came to be highly revered). The monastery had its origins in the late 13th century, when a shepherd discovered a statue of Madonna on the bank of the Guadalupe River. The statue had been apparently hidden by local inhabitants from Moorish invaders in 714. On the site of this discovery a chapel was built. In 1389, monks of the order of St. Jerome took over the monastery and made it their principal house. Even after the monks from Guadalupe founded the famous monastery of Escorial, which was much closer to the royal capital, Madrid, Santa Maria de Guadalupe retained the royal patronage. The little town of Guadalupe isn't close to any of the bigger cities in the area (Mérida, Caceres, Toledo - all 3 WHS by themselves). I drove to Guadalupe from Mérida. This takes about 1.5 hours. A rather boring drive, most memorable was crossing Miajadas: a town which labels itself as the European Tomato Capital. All the money they earn from the tomatoes probably goes into buying new road signs, because the city's streets are littered with them. 40kmh-20kmh-bump in the road-40kmh-20kmh-another bump (and that x10). The monastery of Guadelupe is right at the heart of Guadelupe town. It's a massive building, way too big and impressive for the tiny town square where it's located. As about anywhere I visited on this trip I wasn't the only tourist here: a bus unloaded its ageing Spanish passengers just at the front of the monastery. For only 4 Euros you can join a guided tour inside the monastery. This isn't a contemplative experience - it's never fun being hoarded through a site with a group of about 50 others and here it also is a rushed affair. The most interesting parts for me were the Sacristy and the Reliquaries Chapel. Both have great frescoes adorning their walls and ceilings. Piece de resistance of course is the little Black Madonna. This is left to the end of the tour and is introduced by one of the (Franciscan) monks. 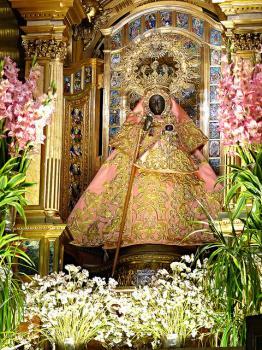 An element at the back of the sanctuary can be turned 180 degrees, and there she is - the Madonna with a black face, in yellow garb and seated on a throne. As of February 2016 guided visit is 5 euro per person. The tour starts from very beautiful collection of tapestry and various bishops' clothes. Then there is a room with huge religious books (mainly 16th century); another room with small art collection (wood carvings and paintings). Tour proceeds to impressive sacrestia (described by the guide as "regna" of Spanish sacrestias). The final part of the tour is lead by a monk, who starts from inspirational speech (as I partly was able to understand it) and then finally rotates a special niche and you could kiss some relic from monk's hands and glance closely at the statue of Madonna. In overall, we liked the monastery, which seem to be very popular amount local Spanich pilgrims even out of tourist season. I visited this WHS in June 2015. Last year, returning from my Portugal road trip and passing through Extramadura I had decided that this WHS was too much of a detour eastwards as it is a good 1.5-2hrs away from Merida or Caceres. This time round, I decided to sleep in a motel in Navalcarnero, just outside Madrid, to head for a 2hr 15mins drive early the next morning. I knew that the first tours of the Guadalupe Monastery would be around 10am as the ticket office opens at 09.30. Judging by the Spanish standards of punctuality plus the fact that before a group of at least 10 people is formed, the guide does not start the tour, the first tour will always be after 10am. Yet I woke up early and I arrived in Santa Maria de Guadalupe just after 08:30. The cathedral and monastery are bang in the middle of the town and just behind the monastery is a small free parking lot. There were no cars parked at that hour apart from the few locals who park their vehicle there overnight. The cathedral was open so after admiring the facade I decided to go in to see the interior. At the door there was a sign indicating that mass was going to be celebrated at 08:45 and truly enough the first elderly people started to come in for mass. Being there so early and seeing the intimate nature of the mass celebrated here in honor of the Black Madonna, I decided to attend mass even though my Spanish is very basic. The church is very old and the interior is still decorated/set up in the old traditional way with an iron gate separating the priest and the believers. After mass, I took a couple of photos of the Black Madonna and I went to the book shop to buy the 5 euro ticket for the guided tour. The tour is done in Spanish only unless you happen to be grouped with a busload of English-speaking tourists accompanied by their English-speaking guide. I was happy this was not my case as it meant that only another 9 Spanish tourists came so early on a Sunday morning and at 10.30 we started the tour with 10 people including myself. It's a very good tradeoff in my opinion as the more people there are the more rushed the tour will be and less time will be allowed to actually see the place. Our Spanish guide spoke very slowly which is quite rare in Spain especially with local tourists. This helped me understand the gist of her explanations at least. There are several things to see: what stood out for me were the 100 huge parchment books weighing over 80kg and in pristine condition (similar to the ones in the Yuso/Suso Monasteries), the brass and bronze rotating structure on which these books were placed, important paintings by Zurbaran including his auto-portrait inclusion in the Reliquaries Chapel, Goya's Confessions in Prison and other minor paintings by Rubens and El Greco. Photos are not allowed inside the monastery although our guide let us take pictures of the ornate courtyard and before exiting the Sacristy I managed to take a quick photo of the beautiful frescoes. The Sacristy and Chapel are full of frescoes and church treasures and a great way to end the tour on a positive note. Just before the tour ends, the guide leaves and a Franciscan monk gives a brief overview of the history of the monastery and some information about the Black Madonna of Guadalupe. The monastery was always under the wing of monarchs and has been one of the most important monasteries of Spain for more than 4 centuries. It was at the monastery that the Spanish monarchs Isabel and Ferdinand signed documents that authorized the first voyage of Christopher Columbus to the New World in 1492. After discovering America, Christopher Columbus made his first pilgrimage here. Our Lady of Guadalupe was also the most important Marian shrine in the medieval kingdom of Castile. After his brief explanations the monk opens a wooden door one of the sides of the Reliquaries Chapel and magically revolves what seemed to be an incredibly beautiful and precious golden frame to reveal the Black Madonna and Her Child. Believers can kiss the reliquary and touch the golden threaded garments. Pope John Paul II had visiting this shrine too and there is a painting to commemorate this event which can be seen before going back out to the cloister. The Mudejar details can be easily admired from the cloister and the obvious highlight is the Mudejar Cloister of Miracles. 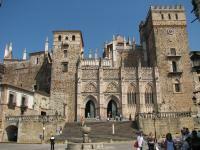 This monastery is really worth visiting for pilgrims and non-pilgrims alike and it is certainly one of Spain's finest. The Iberian peninsula is full of historic monasteries, with a large number of them inscribed on the WH list, and the one in the small village of Guadalupe in Extremadura is probably the most famous of them. It is quite a big and impressive building, a mixture of Gothic and Baroque styles, featuring many important relics and works of religious art, the most famous of them being the Black Madonna (anyone who has already been to Montserrat or Czestochowa is familiar with this). I can't say I was blown away by what I saw, but granted, the place seems to be perpetually crowded with large, mostly Spanish, tour groups, you can only visit as part of a group, and it is hard to actually see much on your own because of this. The cloister was very nice, though, and there are some interesting historic facts about the monastery, as it was the most important one in Span for many centuries and always under the personal protection of the reigning monarch - e.g. after his return from his first voyage, Columbus made a pilgrimage there, and the Madonna of Guadalupe is much revered in the New World, especially in the famous basilica in Mexico. So, an interesting visit if you don't mind crowds, but because of the very remote location only recommended for those with a strong interest in history and/or religious art. Despite its remote location Guadalupe is regularly though infrequently connected by a bus service to Caceres. I recall the journey being slightly scary as the bus swerved around bends across a mountain pass. On the day of my visit I was charged a minimal 3 Euros for a guided tour at 5pm. In our travel around Spain we have been to the nice vernacular village of Guadalupe, where the beautiful Our Lady’s royal monastery stands. It was built from the 14th to the 17th century and is an original mixture of more different styles and above all a strongly symbolic Spanish monument, as it is associated with the Reconquest of the Iberian peninsula by the Catholic Kings Fernand and Isabel and the discover of the Americas by Christopher Columbus, which both happened in 1492. It is also one of the most important pilgrimage places in the world and one of the most sacred places for Spanish-speaking Catholics, above all for those living in all Latin America. In fact the cult of the Virgin statue, found in Guadalupe in the 13th century, was exported in America by Spanish Conquistadores, mainly born in the Extremadura region, in which the monastery is situated; here the first American people were baptised. As it is situated in the middle of nowhere, the travel to go there strongly proved our patience. From Cáceres it is 130 km on a never ending winding (but panoramic) road with some passes, and the same to go away from Guadalupe towards Toledo (180 km). To enter the monastery, the opening time is from 9.30 to 13 and from 15.30 to 19. You can find information about it on the web pages http://www.puebladeguadalupe.net/5monasterio/index.htm. We arrived quite early - but not so much, at 10.30 - and there was a problem: the visits are only available when the number of 50 people is reached and there was nobody waiting. So we had to wait 30 minutes and fortunately they let us get in with a group of only 25 people. It was however interesting to see the fine exterior of all the sides of the monastery, with decorated portals and doors, nice strong towers and slender turrets, and above all the stunning monumental façade, called atrium, of the church, with its strange fine curvilinear decoration, rose windows, a beautiful dome and portals; the doors are decorated with wonderful bronze plaques. Only from the exterior, you can see the 18th century New Church, built by a descendant of Christopher Columbus. First the guide brings you to the beautiful cloister, built in brick from 1389 to 1405 in the Mudéjar style (Christian application of Arab architectonic features) and painted in white and red. There is a nice Plateresque portal and a small Gothic pavilion in which a fountain is located. The architecture is quite impressive, but the most striking and original feature here is the small Mudéjar chapel in the middle, very harmonic with its strong base of arches and a slender group of green points on it. I’ve never seen a type of building like this before. We haven't visited the second Gothic cloister in the guided tour and I don’t know even if it is accessible. After the cloister you will visit the quite boring Museum of Vestments, the Museum of Illuminated Books, with nice exemplars in the Gothic Chapter House, and the Museum of Ancient Paintings and Sculptures, with beautiful works by great artists like El Greco, Francisco Zurbarán and Francisco Goya, all situated on the ground floor. The visit continues on the first floor and first brings you to the stunning Baroque sacristy (preceded by a nice room and followed by the Saint Jerome’s Chapel), built in the 17th century, one of the most beautiful in Spain, with fine decorations and above all the striking 11 paintings by Zurbarán; it is maybe the nicest feature of the monastery. Through the Saint Catherine's chapel, built in the 15th century, square with an octagonal dome with lantern, containing nice tomb, you will reach the octagonal 16th century Reliquaries Chapel, which contains in alcoves interesting reliquaries. Another wonderful feature of the monastery is the adjacent 17th century Baroque Camarín de la Virgen, a small octagonal building situated behind the presbytery of the main church. The ground floor, finely decorated, is accessible from the church, while you will visit the upper floor in the guided tour. The vaults are finely decorated with plaster and stucco and above all the walls are covered by 9 stunning paintings by Luca Giordano. The last part of the tour was led by a monk and in the Camarín turned out that our visit was more intended as a pilgrimage, naturally paid, to see the Virgin and, above all, to kiss its reliquaries; obviously this ritual seemed us strongly exaggerated also because almost all the visitors, or rather pilgrims, after a prayer recited by the monks, formed a queue and the sculpture was turned from the church to the Camarín, as it is possible to turn it to both the sides. The visit ended in the church, built in the 14th and 15th centuries, also accessible without buying the ticket. 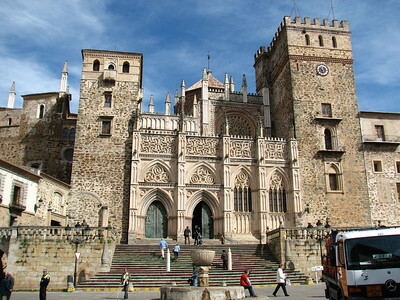 It has three aisles and a wonderful Gothic vaulting (the nicest is that of the dome) and contains beautiful tombs and altars, notably that of the Major Chapel, belonging to the typical Spanish typology of the retables, enormous sculpted and painted main altars that you will find only in the Iberian peninsula. I quite liked this monastery, perfectly conserved and authentic, because of its quite unusual combination of beautiful Gothic and Baroque art but I think that it is rather worthy to be visited if you are in the Extremadura region more than in a separated travel to see specifically it. I think it justifies its inscription on the WHL (the title of the WHS may be more precise with the official Spanish name of the monastery “Nuestra Señora” rather than “Santa Maria”) and maybe a more important reason than its beautiful architectonic and art features is its connection with important events in the world history and with the widespread cult of the Virgin. In the picture is the main façade of the church of the monastery. 3.5: Philipp Peterer Antonio J. 90 Community Members have visited.